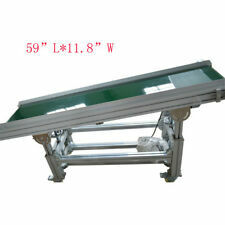 Conveyor Top:-Stainless Steel. Driving roller shaft dia. :- 10mm. PrecisionRibbons Conveyor Roller 305mm x 33mm Hollow Hard Anodized Aluminum for Boekels Checkweigher Hardened Aluminum. Roller Width:- 305mm. Roller Dia. :- 33mm. Guardrail Width: 28cm (11" ). 1 X Guardrail Set. This belt conveyor is made offull stainless steel, with automatic speed and steady speed circuit of the electronic governor. It has higher stability and bestconveyor belt made with Italian high anti-static PVC industry, ensuringhigh anti-static ability. PhotoCraft RH-P240AJ/8-30 Encoder & MB-UB1 Conveyor Part Kit ! NEW ! 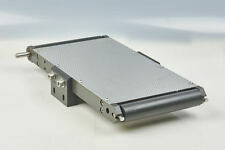 Bosch UM2/B-240 Belt Return Unit 240mm Return Width 12m/min 575V/60Hz. ! WOW ! FlexLink XBTP-5A85-FA Plastic Friction Top Chain X85 ! NOP ! An inclinated conveyor in good condition. The conveyor comes with a flat belt and is on wheels. The belt dimensions are 11in (W) X 10ft (L) X 6ft (H). The equipment are sold as is where is, but can be tested without product on your request. Roller Width:- 208mm. Roller Dia. :- 30mm. Rollers Material:- Hardened Aluminum (hard anodized) (up-to 3 x more wear resistant that stainless steel). IEC 60947-5-1. IP67 Ui 500v. Uimp 6kV.AC-15. I have 20 available. 650MM X 1200MM. 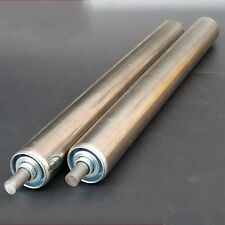 Very Heavy Duty Rubber Covered Conveyor Roller And Bearings. Intralox Conveyor Belt Series 400 14” X 10’ Roller Top 2” Pitch 30 Degree NEW New 10’ Never used. Oasis Machinery T1732L Flexible Gravity Roller Conveyor Height 940mm Roller Dia 50mm. Model # T1732L byOasis Machinery. Oasis Machinery T1732L Flexible Gravity Roller Conveyor. Flexible conveyors are designed for versatility. REYNOLD CHAINS B.S. 110056 10B-1 5/8"Pitch Roller Chain link industrial Conveyor - APPROX 25ft 7.62m. Tested and Working. We will always list any faults we are aware of. Physical condition is good. Credit Card. Wirebelt® Flat-Flex®. 1/2" pitch. Very low belt mass. 14" W x 50' L. Single loop edge. 24 Strands per foot. Typical Applications. Oriental Motors 5IK90GU-SH-ASSY Conveyor Assembly 1/8HP 230VAC 1600RPM ! WOW ! Comas FISET WVII1094CE Weigh Belt Panel & Rack ! WOW ! Tsubaki RS16B-1 Roller Chain Lin Pitch 120 Links 10 FT ! NEW ! Itoh Denki PM486FP-100-322-D-024-JR-P2 Conveyor Roller 24VDC 100M/min ! WOW !